However, as to the 'aesthetic shape' of it...if anything, that would (believe it or not) actually tend to be an argument for it being an ink bottle. While not all fountain pen ink is packaged so extravagantly, there are quite a number of ink makers who even yet today still package their products in very fancy and ornate bottles. It's a cachet thing, primarily. 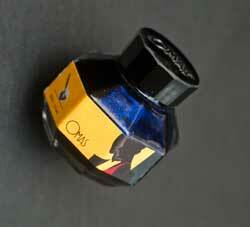 A present-day Visconti ink bottle, a Faber-Castell ink bottle, and an Omas ink bottle. All of these are essentially the same shape bottle that each of these companies has produced since the 20's or 30's...or before. Even makers such as Waterman and Schaeffer package in less than pedestrian forms. A quick Google image search should reveal quite an array of ornate designs. Like I said....it's a cachet thing. Go back to the very first post in this thread where Ric describes this as an "ointment pot", a form apparently well known in the glass jar / bottle enthusiast communities. The purpose for the shape is to allow you to get your finger(s) in there and scoop stuff out, right down to the last little bit of mercury laced toxic substance. If it had a more traditional squared off base, it would be near impossible to get the last remaining remnants out with your finger. Getting the last bit out of an ink bottle may also be somewhat problematic, but I don't think rounding the bottom would improve things much, and may actually make it more difficult to get the last bit of ink sucked into your fountain pen. Looking at these ink bottles certainly brings back a few memories though. For a while, I found and used my grandfather's fountain pens. Was great fun to work with them and see how different you could get your script to look, but I have to admit it cost me a few ink stained shirts along the way. Mom was not pleased. Good point Andrew, I hadn't considered the 'access' angle. Which leads to the if you accidentally knock it over angle. If it was ink inside you are guaranteed to lose the lot. I guess that's why the ink pots we have seen so far have a small access point, if you knock it over you don't lose it all, or ruin your parents carpet. It seem's that Dr Berry also made a pocket mirror to go with the ointment pot obviously for application, so i wonder if they came as a set ? Hey Guys!!! Its so very late and need to get this posted. But, been searching for answers to this glass jar tonight and ran across something. Here is a pic of the smaller freckle cream jar? Found this on worthpoint.com!!! Not to sure on if its been sold or not? Trying to find out!!! It is the Freckle Cream jar (except in white glass v. the clear glass of the artifact). I will pass along your find to Joe C. who is the "Freckle Cream" guy. As regards to the clear glass jar purported to be an inkwell bottle, Joe queried the seller he purchased the jar from and learned that he (the seller) had purchased it in a group of jars all thought to be inkwells, but he didn't know whether that specific jar was actually an inkwell or not. Joe tells me that this is the very jar he purchased last summer which is now in the hands of TIGHAR. It was on display at the symposium. I'm glad that you have "tuned your eyes" to spot these jars, as they seem to be very few and far between. Someday, maybe we'll find one in clear glass with the label intact, if we're lucky. Would it be out of place for a company like hazel glass, or Dr Berry, to provide a ointment pot that was usable in flight ? Hey Guys! Good Evening!!! Hope most of you had an excellent day and the start of a wonderful weekend? Anyway, received an awesome email from Joe Cerniglia. The email he sent is in regards to recent testing of the ointment pot/jar found on the island. Anyway, hope most of you find this exciting as it did me! .....Randy...Hello!!! I thought you might like to have this news to share with others on the forum! Evans Analytical Group in Syracuse, New York has reported today that 3.4 micrograms per liter of mercury was detected from the ointment pot (Artifact 2-9-s-1). When you've a spare moment, can you find the dimensions of the Dr. Berry's box we have? This is the measurements I have Ric...Hope you were referring to me on this matter!!! Glad to see you made it safely home!!! This is the measurements I have Ric...Hope you were referring to me on this matter!!! Sad to say, the box does not seem to have returned from the symposium in Washington. It was in the exhibit case and I'm quite sure I packed it with the other artifacts at the conclusion of the event but, in unpacking afterward, it was not there. Fortunately we have lots of good photos of it but I hope the box turns up. One of the adverts for "Dr Berry Freckle Ointment" It says send off for free booklet, Has anyone searched or come across one yet ? At the bottom you can see a big bottle with silver cap, The jar is bottom right of that.